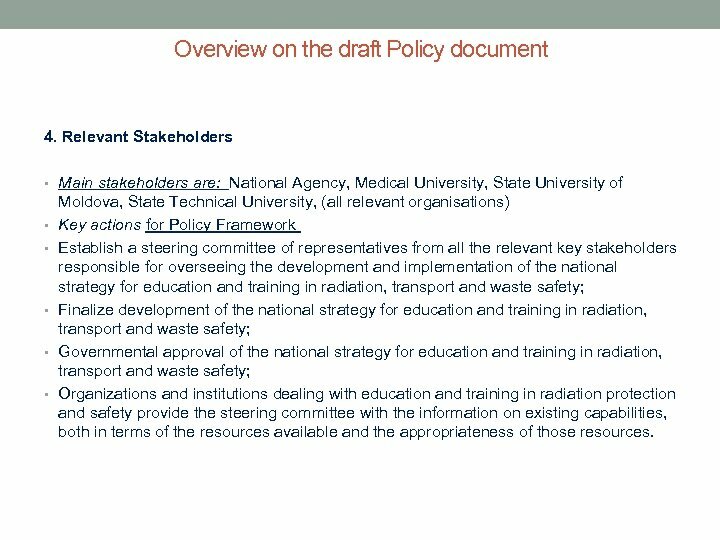 Introduction At the moment, does not established a separate document on national policy for education and training in radiation, transport and waste safety or special strategy in this area, but the subject is the part of the university programs of the National Strategy for Education. Was signed memorandums of understanding between the Regulatory Body and some universities from Moldova. 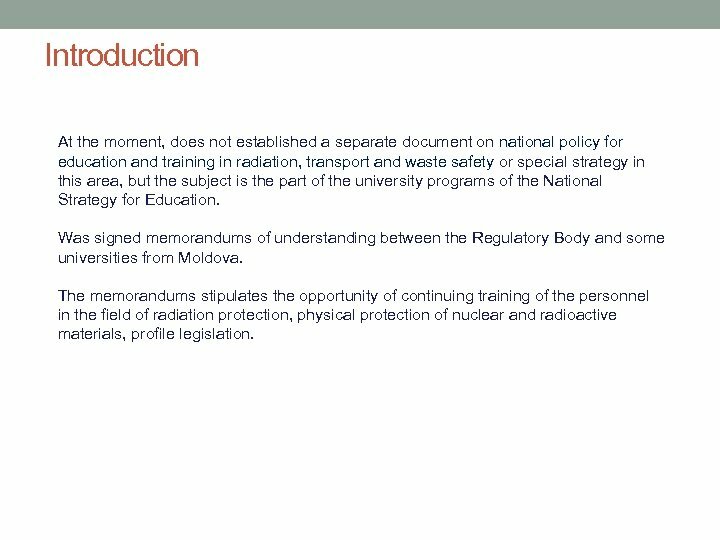 The memorandums stipulates the opportunity of continuing training of the personnel in the field of radiation protection, physical protection of nuclear and radioactive materials, profile legislation. Introduction (2) The Law No. 132 of 08. 06. 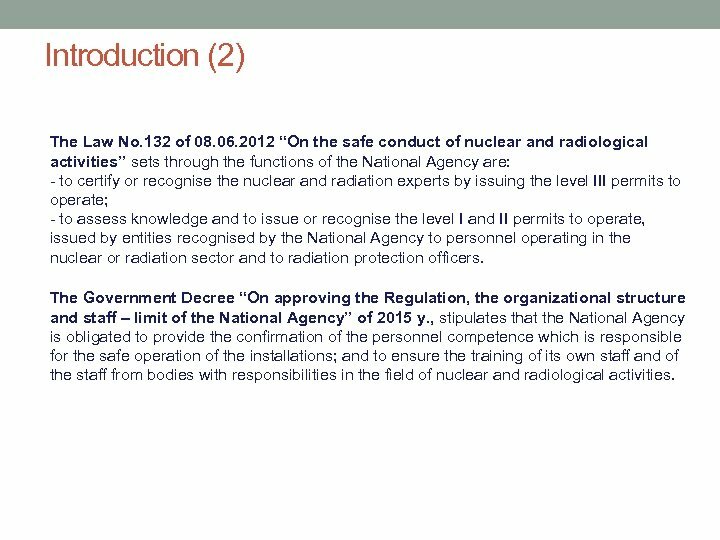 2012 “On the safe conduct of nuclear and radiological activities” sets through the functions of the National Agency are: - to certify or recognise the nuclear and radiation experts by issuing the level III permits to operate; - to assess knowledge and to issue or recognise the level I and II permits to operate, issued by entities recognised by the National Agency to personnel operating in the nuclear or radiation sector and to radiation protection officers. The Government Decree “On approving the Regulation, the organizational structure and staff – limit of the National Agency” of 2015 y. , stipulates that the National Agency is obligated to provide the confirmation of the personnel competence which is responsible for the safe operation of the installations; and to ensure the training of its own staff and of the staff from bodies with responsibilities in the field of nuclear and radiological activities. 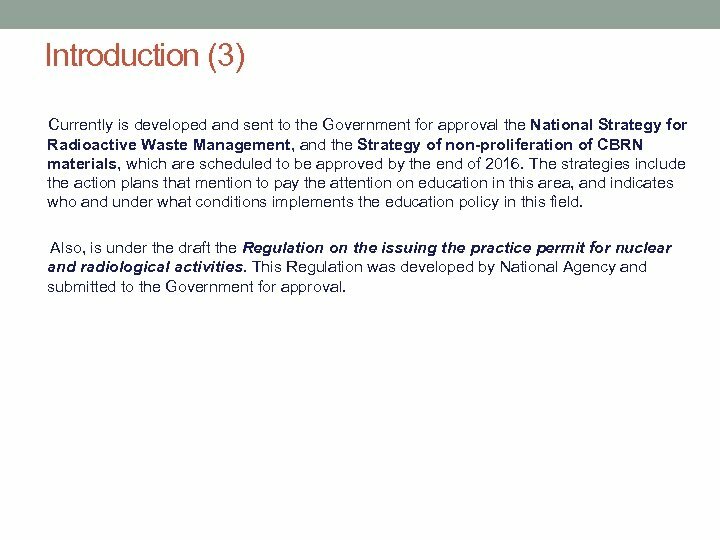 Introduction (3) Currently is developed and sent to the Government for approval the National Strategy for Radioactive Waste Management, and the Strategy of non-proliferation of CBRN materials, which are scheduled to be approved by the end of 2016. 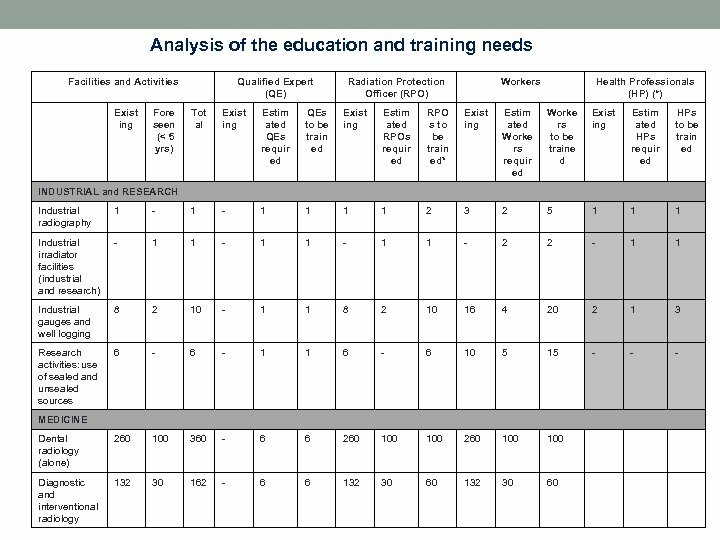 The strategies include the action plans that mention to pay the attention on education in this area, and indicates who and under what conditions implements the education policy in this field. 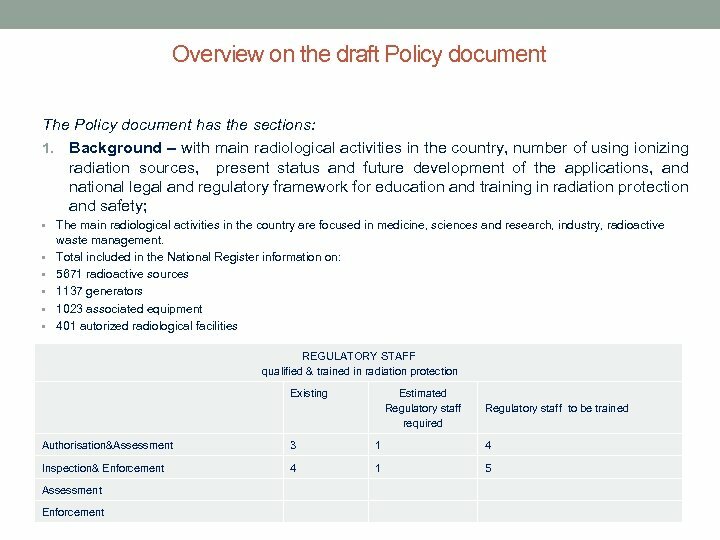 Also, is under the draft the Regulation on the issuing the practice permit for nuclear and radiological activities. This Regulation was developed by National Agency and submitted to the Government for approval. Overview on the draft Policy document 2. 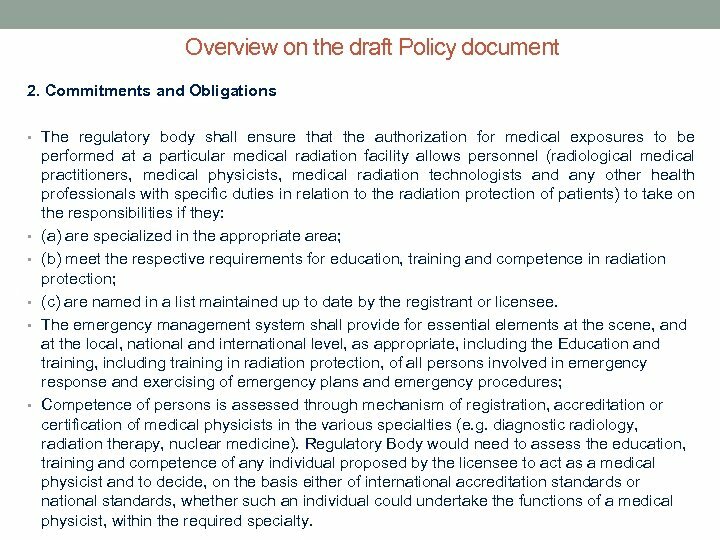 Commitments and Obligations • The regulatory body shall ensure that the authorization for medical exposures to be • • • performed at a particular medical radiation facility allows personnel (radiological medical practitioners, medical physicists, medical radiation technologists and any other health professionals with specific duties in relation to the radiation protection of patients) to take on the responsibilities if they: (a) are specialized in the appropriate area; (b) meet the respective requirements for education, training and competence in radiation protection; (c) are named in a list maintained up to date by the registrant or licensee. The emergency management system shall provide for essential elements at the scene, and at the local, national and international level, as appropriate, including the Education and training, including training in radiation protection, of all persons involved in emergency response and exercising of emergency plans and emergency procedures; Competence of persons is assessed through mechanism of registration, accreditation or certification of medical physicists in the various specialties (e. g. diagnostic radiology, radiation therapy, nuclear medicine). Regulatory Body would need to assess the education, training and competence of any individual proposed by the licensee to act as a medical physicist and to decide, on the basis either of international accreditation standards or national standards, whether such an individual could undertake the functions of a medical physicist, within the required specialty. 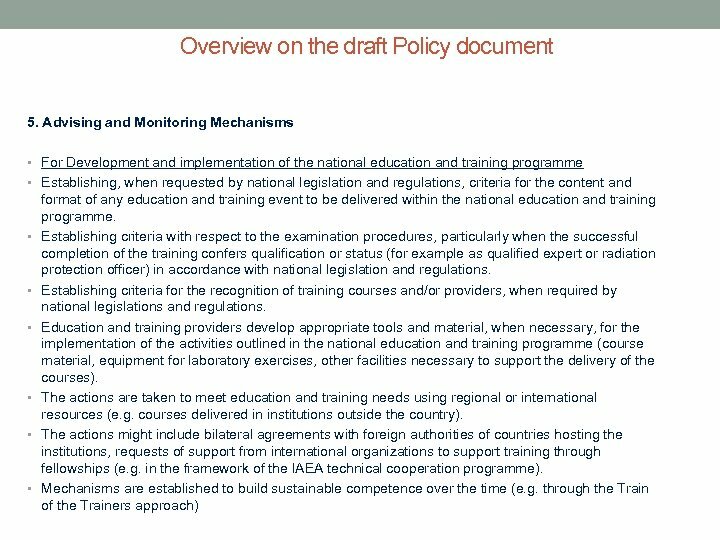 Overview on the draft Policy document 3. 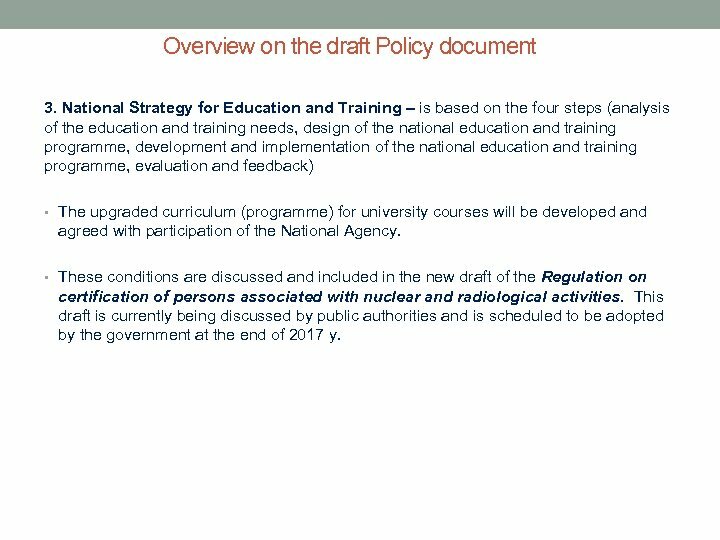 National Strategy for Education and Training – is based on the four steps (analysis of the education and training needs, design of the national education and training programme, development and implementation of the national education and training programme, evaluation and feedback) • The upgraded curriculum (programme) for university courses will be developed and agreed with participation of the National Agency. 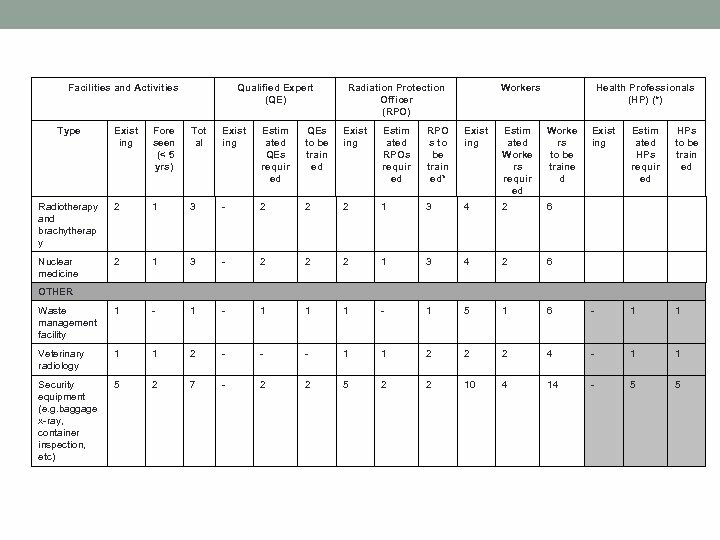 • These conditions are discussed and included in the new draft of the Regulation on certification of persons associated with nuclear and radiological activities. This draft is currently being discussed by public authorities and is scheduled to be adopted by the government at the end of 2017 y.
Overview on the draft Policy document 4. Relevant Stakeholders • Main stakeholders are: National Agency, Medical University, State University of • • • Moldova, State Technical University, (all relevant organisations) Key actions for Policy Framework Establish a steering committee of representatives from all the relevant key stakeholders responsible for overseeing the development and implementation of the national strategy for education and training in radiation, transport and waste safety; Finalize development of the national strategy for education and training in radiation, transport and waste safety; Governmental approval of the national strategy for education and training in radiation, transport and waste safety; Organizations and institutions dealing with education and training in radiation protection and safety provide the steering committee with the information on existing capabilities, both in terms of the resources available and the appropriateness of those resources. Overview on the draft Policy document 5. Advising and Monitoring Mechanisms • For continued assessment of education and training needs The steering committee, on the basis of the information collected, assess the national education training needs The steering committee matches the identified education and training needs with the existing national capability for the provision of education and training, identifying: • The education and training needs that may be addressed using available national resources and capabilities; and • The residual education and training needs that may be addressed either by - Using available resources outside the country, and/or - Building capability (over time) within the country (e. g. train of the trainers). 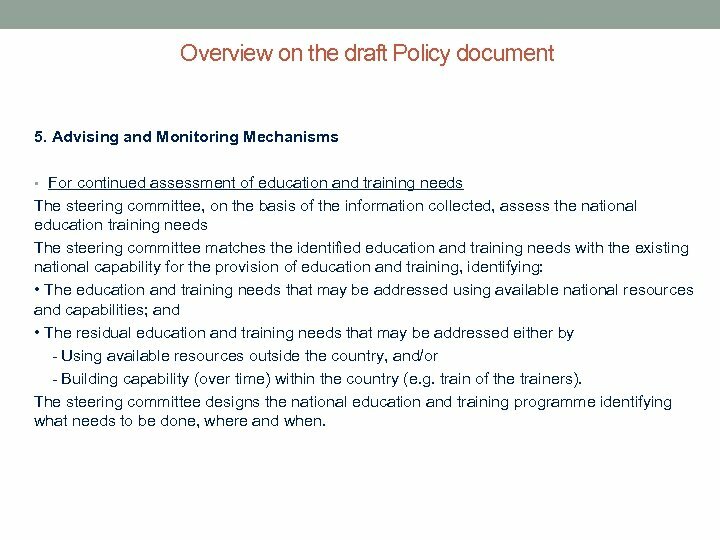 The steering committee designs the national education and training programme identifying what needs to be done, where and when. 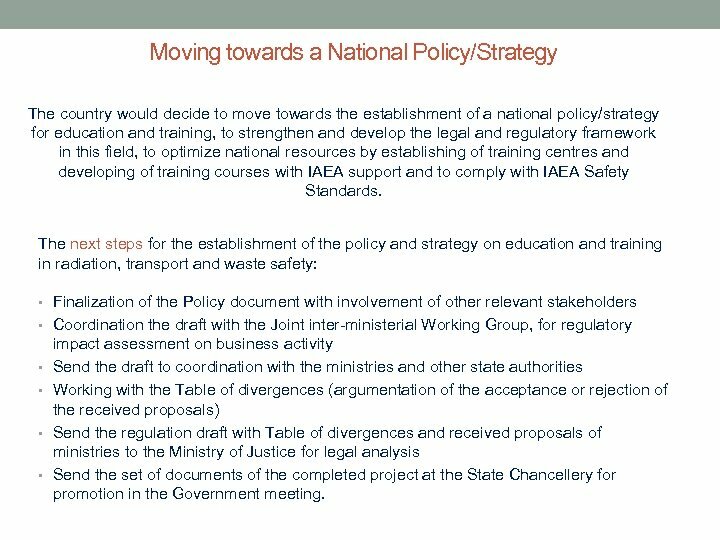 Moving towards a National Policy/Strategy The country would decide to move towards the establishment of a national policy/strategy for education and training, to strengthen and develop the legal and regulatory framework in this field, to optimize national resources by establishing of training centres and developing of training courses with IAEA support and to comply with IAEA Safety Standards. 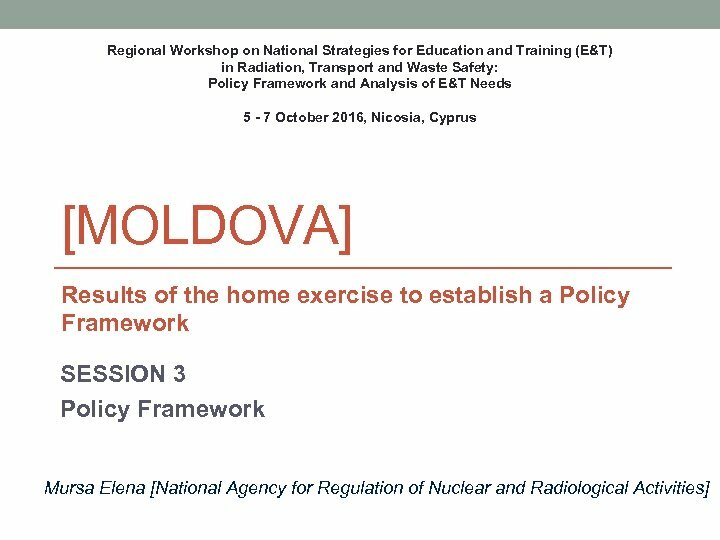 The next steps for the establishment of the policy and strategy on education and training in radiation, transport and waste safety: • Finalization of the Policy document with involvement of other relevant stakeholders • Coordination the draft with the Joint inter-ministerial Working Group, for regulatory • • impact assessment on business activity Send the draft to coordination with the ministries and other state authorities Working with the Table of divergences (argumentation of the acceptance or rejection of the received proposals) Send the regulation draft with Table of divergences and received proposals of ministries to the Ministry of Justice for legal analysis Send the set of documents of the completed project at the State Chancellery for promotion in the Government meeting. 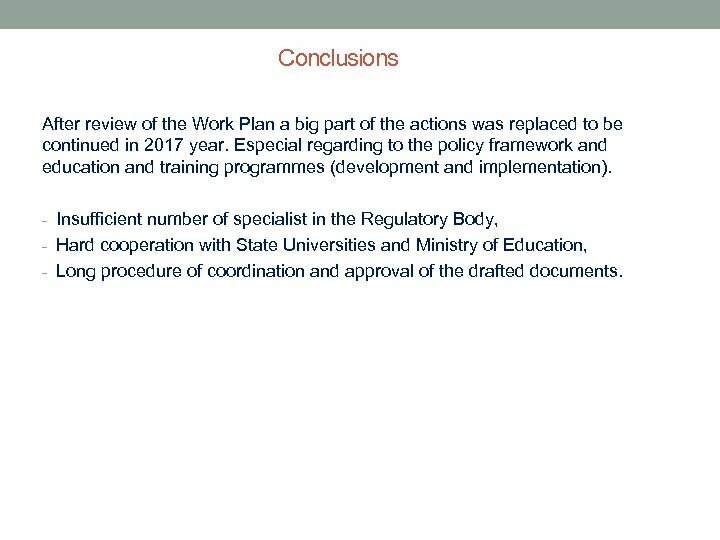 Conclusions After review of the Work Plan a big part of the actions was replaced to be continued in 2017 year. Especial regarding to the policy framework and education and training programmes (development and implementation). 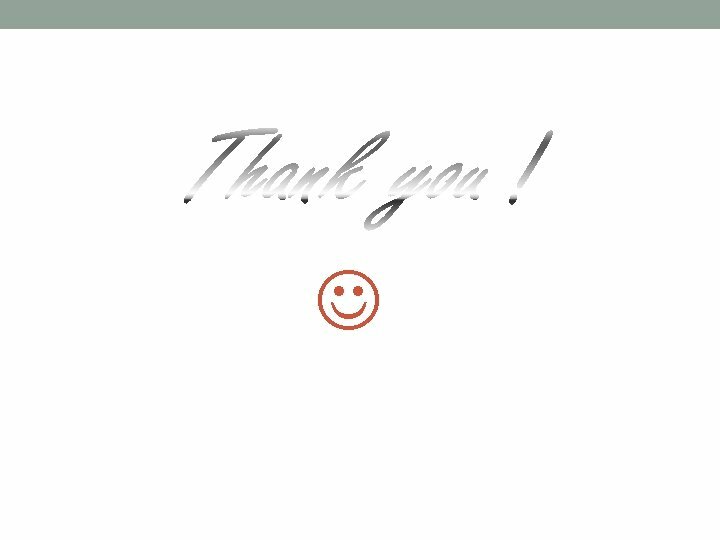 - Insufficient number of specialist in the Regulatory Body, - Hard cooperation with State Universities and Ministry of Education, - Long procedure of coordination and approval of the drafted documents.